The Wear Puppet EVA-WP-4000 Allover is a power suit design from the classic 1980’s Japanese mecha series Galactic Drifter Vifam. It’s a dumpy, simplistic design with a lot of charm. I recently got a new modeling book with some Vifam lineart in it. When I saw the Allover, I immediately thought ‘I could totally make that’ and began figuring out the basic shapes and whipping up some models. I changed some bits and details along the way, coming up with my own variant I nicknamed the ‘Allaround’. 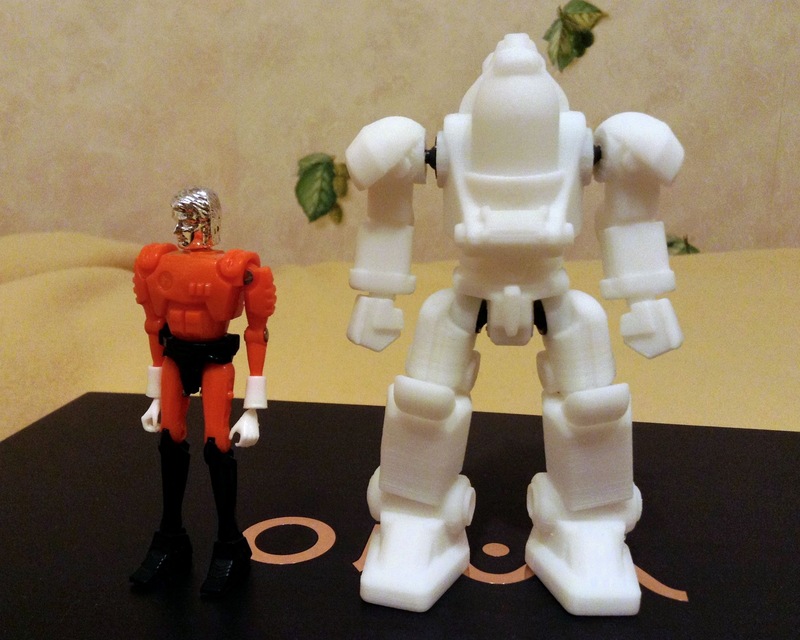 Read on to see how a figure goes from shapes on a screen to a plastic toy. 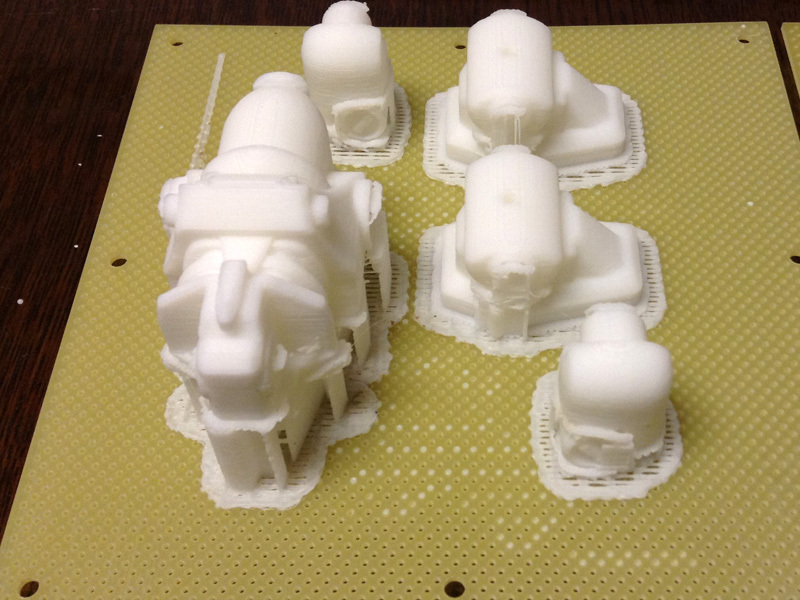 Once an idea exists as a 3D model, it is opened in the printer software and prepped for printing. The model has to be arranged on the build platform, and then the printer software cuts the model into horizontal slices that the printer understands as layers of action it will perform. 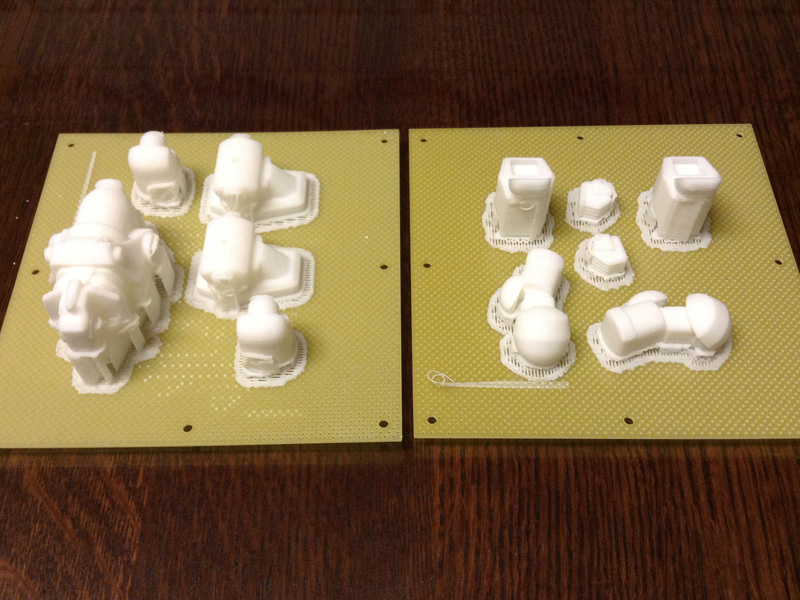 Then it’s off to the races while the printer happily churns away on new plastic goodies. 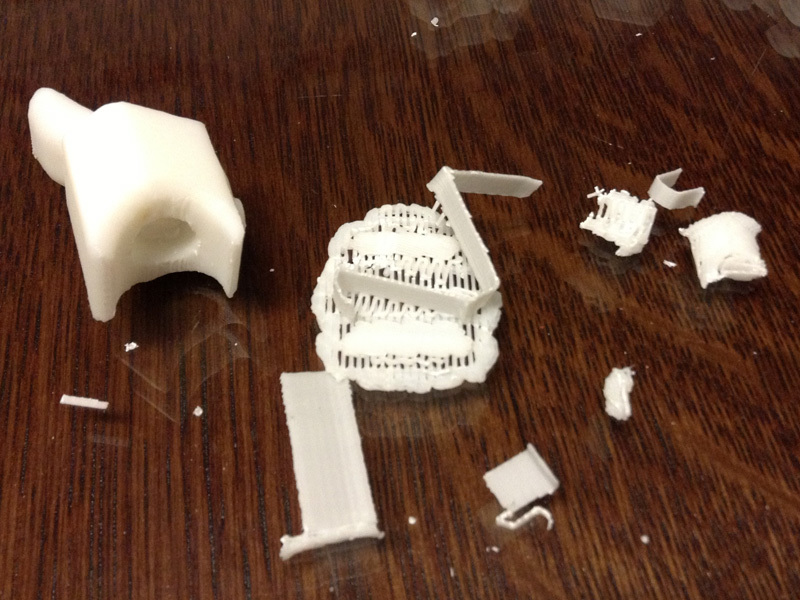 The print surface is removed from the printer with the parts still adhered to it. The extra border of plastic underneath each part is called a ‘raft’, and is a lower density layer or two of plastic that sticks the model to the print surface so it cannot move by accident, as well as providing a welcoming surface to start assembling the model and support material. 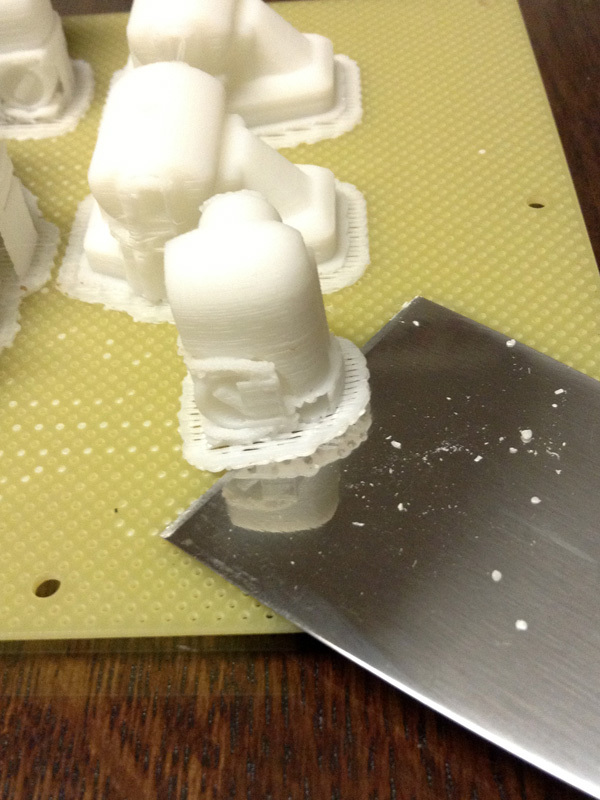 The parts are removed from the print surface using a metal spatula. This stage is so exciting. All the parts are free now, but still have to be cleaned up. Removing the raft and support material is a pretty therapeutic exercise. The support material is printed at a lower density and only tacked on to the actual parts in a few spots, so it mostly peels and pulls right off the parts by hand or with tweezers. Once in a while some support material ends up in a more awkward spot that requires an X-acto blade to remove. Removing the support material also makes a MESS! Now we have all the parts laid out. At this point I like to test fit everything but not glue anything. That way I can fill and sand the parts once I know they’ll all work together. Here’s the Allaround version 0 laid out to check fit. 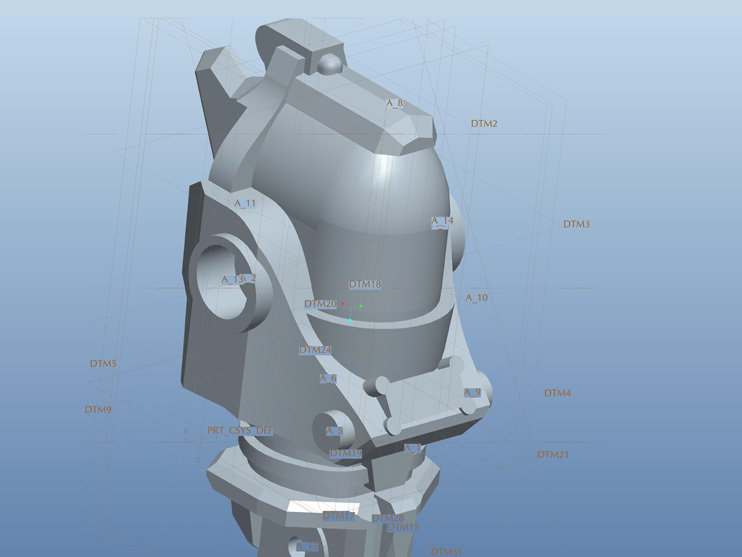 I had a couple issues with the fit of the joint parts at this stage, so it was back to the computer for some revisions. All better! After some tweaks, the Allaround fits together and works exactly as intended. Now I have to work up some accessories, and make a few more tweaks for cleaner printing. 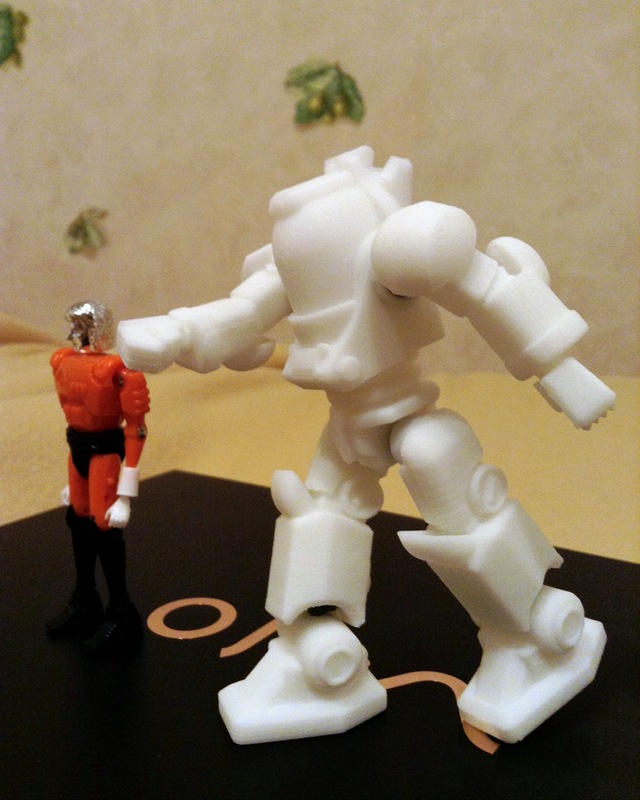 The current Allaround stands around five inches tall and is about Microman (1/18) scale. Seems like a perfect size for a production power suit action figure, huh? The Allaround is articulated using aftermarket plastic ball and socket joints at the shoulders, hips, and ankles. The final version will also be articulated at the waist. Thanks for reading! Let me know what you guys think of the process and the design. LOOKS AMAZING! Where did you get the grey joints at? 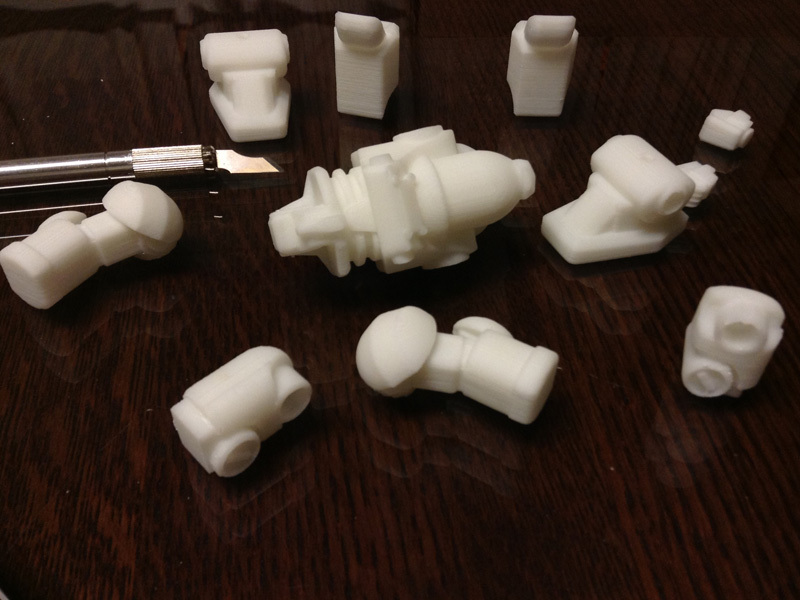 They look like Gundum joints maybe?… I know there are places you can buy them separately online, though I just can’t find any at the moment. Thanks! Err.. “Gundam.” Spellcheck just doesn’t pick up on that sort of thing, does it? Hahah…. They are Gundam-style joints made by other Japanese hobby companies including Kotobukiya and Wave. They come as sprues of different styles and sizes. I buy all my supplies from Hobby Link Japan. amazing stuff! what kind of 3d printer do you use? Is it a Makerbot? How do you laint the printed parts?Do you use normal acrylic color like for ABS models? Hi Peter! Thanks for looking. I am using an UP! 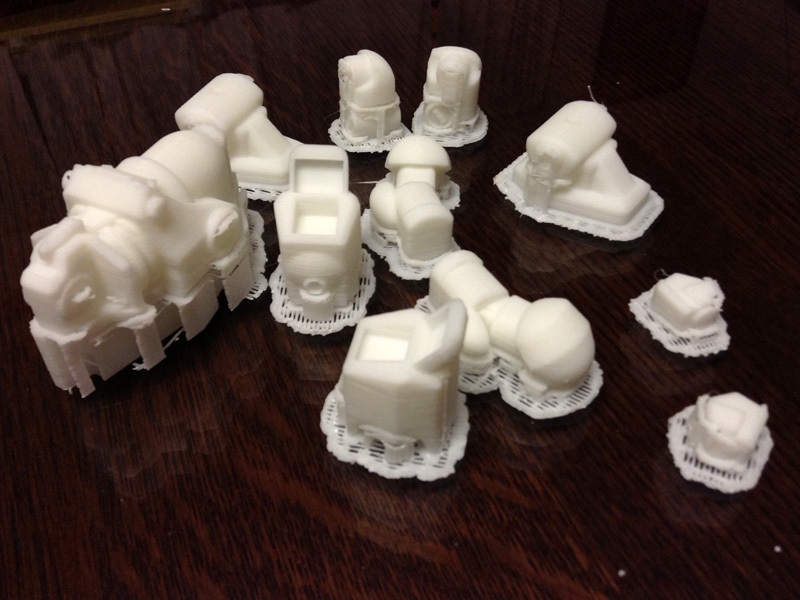 Mini printer from PP3DP, which you can learn more about in this post: UP! Mini Arrives on PRS. 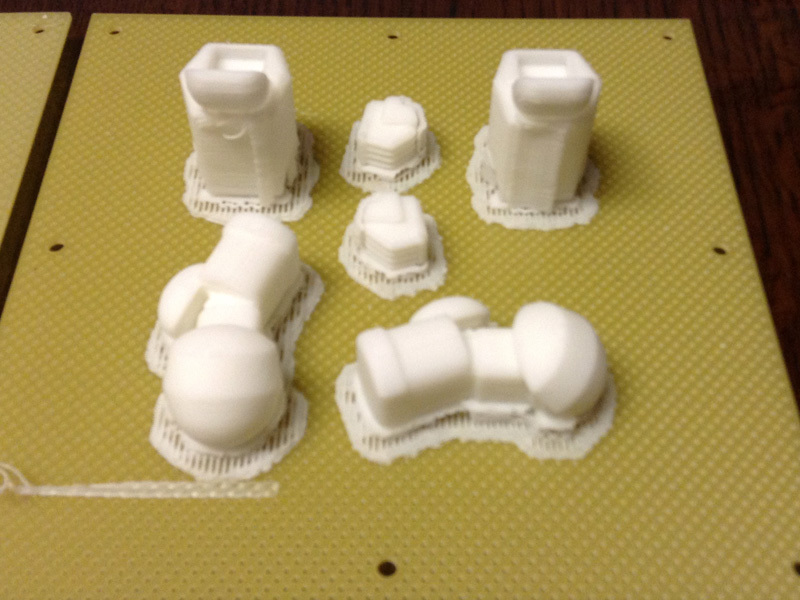 I have met a few Makerbots and Makerbot owners and have not been impressed with the reliability of those machines. UP! printers are designed to be ready to go out of the box with the most ease of use, and that was what I experienced. As for paint, I use a combination of Monster Kolor lacquer-based paints, Vallejo acrylics, oil paints, and MIG and Tamiya weathering pigments. 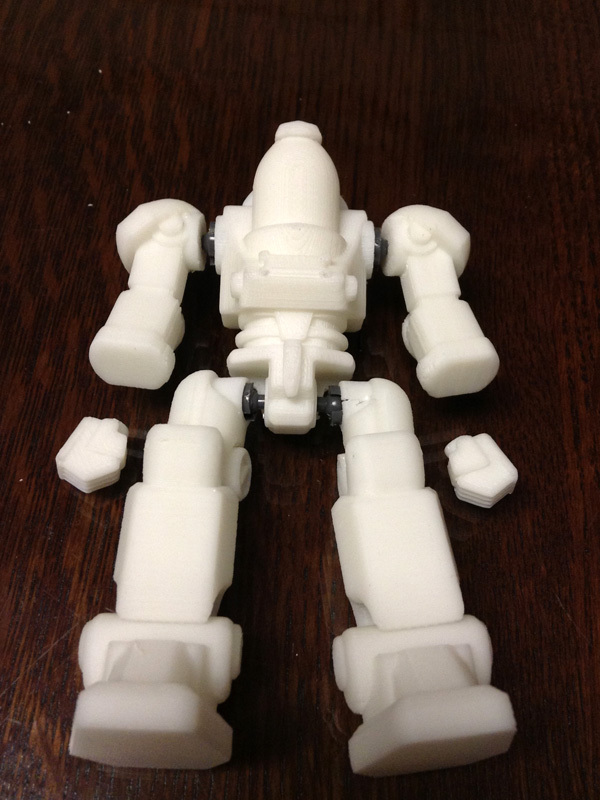 Once sanded and primed, the printed figures can be painted just like any other plastic model or toy. If you have any more questions, please ask away!